Pro planetologist R. Lorenz called for photometry and spectroscopy of Titan to nail down the reason for its brightness changes. Hubble and Keck give some clues at high angular resolution, but frequent photometry with small telescopes would provide important links, continuing Lockwood's longterm lightcurve. 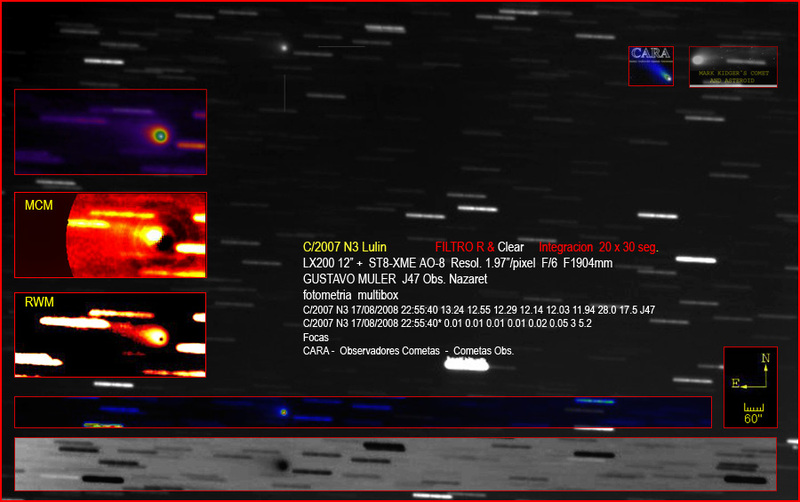 S. Kowollik has found some correlation between amateur images storm activity on Saturn in 2008 and (so far unpublished) radio bursts detected by Cassini if the spacecraft was close to the planet. A quantitative analysis was hampered by the unwillingness of most photographers to supply unprocessed raw images if they had kept the data at all. Observers from France and the U.K. outlined the quality of atmospheric feature drift measurements on Jupiter that modern imaging and semi-automatic analysis techniques have enabled; about 5 years ago electronic imaging at high frame rate with proper postprocessing finally began to exceed what the eye could discern in the best moments of seeing. Predictions based on amateur data of where a specific storm would be on Jupiter when New Horizons came by were even used by the project to accurately point the LORRI camera. There was also a call to observe mutual phenomena of the Jupiter and Saturn satellites as both planets go through their rare equinoxes in 2009 - since esp. the Galilean satellites are very bright, even amateur equipment requires special techniques (read: defocus!) to deal with their blazing disks. Good lightcurves enable the measurement of extremely subtle orbital effects that cannot be seen in usual astrometry. And space scientist/amateur astronomer D. Koschny reminded everyone of six basic rules every amateur must follow to produce valuable data: understand your equipment (e.g. timing issues), calibrate measurements, have a goal in mind (field, depth & resolution can't be had all at the same time), use standard reduction procedures, document all steps and publish and archive properly. A NASA telecon is still ongoing in which Ulysses measurements are being discussed which show a marked change in the state of the solar wind between the last minimum of solar activity in the mid-1990's and now: The electron density is down 20%, the electron density 30% and the dynamic pressure of the solar wind - which determines the extent of the heliosphere - 20 to 25%. At the same time the solar corona doesn't look unusual. Apparently there are solar cycles much longer than the 11-year one at work: The solar wind is now "less hard" than at any time when in-situ measurements began in the 1960's. Perhaps the upcoming minimum of the longer Gleisberg cycle plays a role - but there is no indication of another Maunder Minimum on the horizon. The new sunspot that appeared yesterday and is now developping was actually quoted at the telecon as evidence that the new cycle will soon take off. What the lower solar wind pressure means for near-Earth effects is not clear either: In general more (hard) cosmic rays from outside the heliosphere can enter now, and the Earths thermosphere is cooling - meaning that space debris has longer life times in orbit. Solar observers are celebrating a small sunspot from the new cycle that has just appeared - after so many months of low activity even this minute visitor is welcome. But is the current solar minimum really longer than any in recent memory? Indeed it is, an important analysis by Peter Meadows in The Astronomer (45 [Aug. 2008] 99-100) recently showed, but there have been much longer minima in the past centuries. He defines the length of the minimum as the interval when the 13-month average of the international sunspot number falls below 20: These periods have ranged from just one year in 1965 to 8 years in the early 19th century. The smoothed number fell below 20 in January 2006, and thus the current minimum will last at least 2.5 and perhaps 3.5 years. In any case it is the longest since the one from 1931-35, confirming the suspicions of an unusually long one - on the timescale of a human life, that is. Meadows also finds a moderate correlation between minimum duration and the height of the next peak: expect a moderate one with a maximum smoothed number of 110 to 120. According to Ulysses data, by the way, the solar wind is at a 50-year low: NASA will hold a telecon about that finding later today. 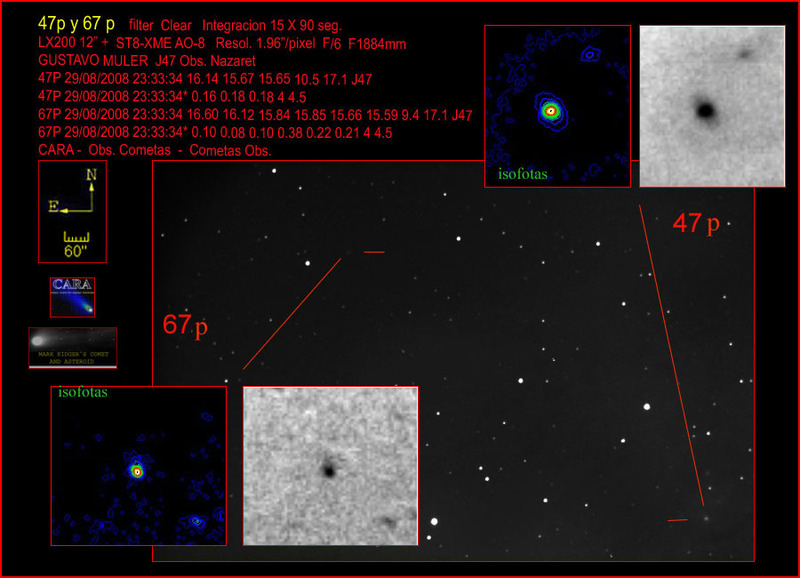 Record distance for gamma ray burst: redshift 6.7! GROND, the Gamma-Ray Burst Optical Near-IR Detector sitting behind an old 2.2-meter telescope in Chile, on September 13 has found the most distant gamma-ray burst ever detected. 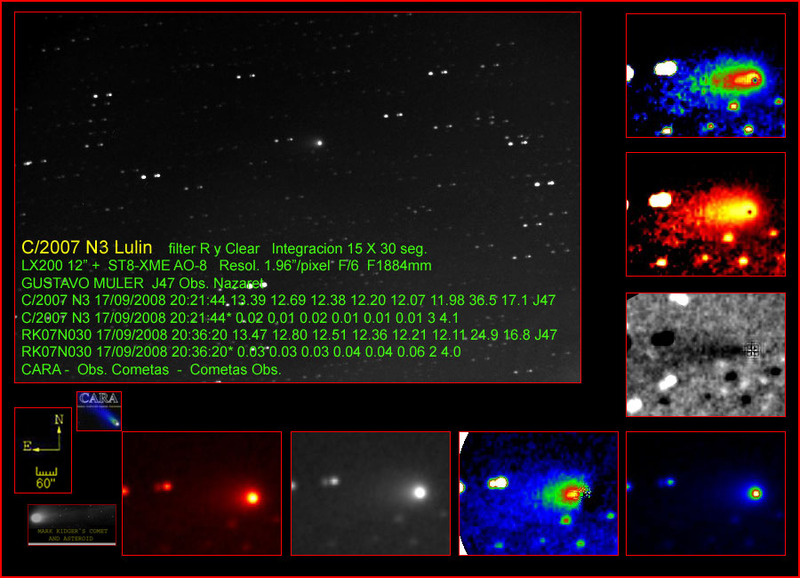 Alerted by the Swift satellite, the unique instrument taking images in 7 different colors obtained a rough redshift only minutes later, which was confirmed 1½ hours later with the Very Large Telescope. At a redshift of 6.7 GRB 080913 occurred less than 825 million years after the Universe began, and the star that popped off this shot seen across the cosmos died when the Universe was less than one-seventh its present age. The most distant GRB before had a redshift of 6.3 and was was 70 million light years closer to us. • And another astrophysics record of some importance: the least luminous galaxy is the dwarf Segue 1, full of dark matter. In other news a sensational new image composite of the 1 August TSE has been released by M. Druckmüller, showing coronal streamers for 20 solar radii and many stars, including the Beehive cluster, in the background. • Tonight the Moon once more occults the Pleiades, in Europe only on Saturday morning. • The evening planets as seen from Oz in mid-September. • Comet Lulin on the 17th - and new page on all comets in the sky right now and how easy or hard they are. (This and this catalog are excellent additions.) • Two bright sun dogs today. • A political article on light pollution as an overlooked environmental problem. • The ISS transiting the Moon and in much detail. • And ... it's alive: ISEE 3 alias ICE, the first spacecraft to visit a comet. Which was in 1985, already in an extended mission! Amidst unresolved issues regarding the circumstances of its discovery, the big and weird Kuiper Belt Object 2003 EL61 has been named Haumea and is now listed as the 5th dwarf planet, joining Pluto, Eris and Makemake in the Kuiper Belt and Ceres in the main belt of asteroids; no further immediate candidates for ascension into this category of solar system bodies introduced only in 2006 are known. The two satellites of Haumea are now called Hi'iaka and Namaka. While the IAU refrains from saying anything about the discoverer(s) of Haumea, the USGS in its list locates the discovery telescope in Spain (where it was imaged but not recognized in 2003) yet also names no people. Mike Brown, who hit upon the same body in 2004, realized that it was something important and is generally credited with the discovery, meanwhile in great detail reiterates his claim of being the rightful owner of this dwarf planet. 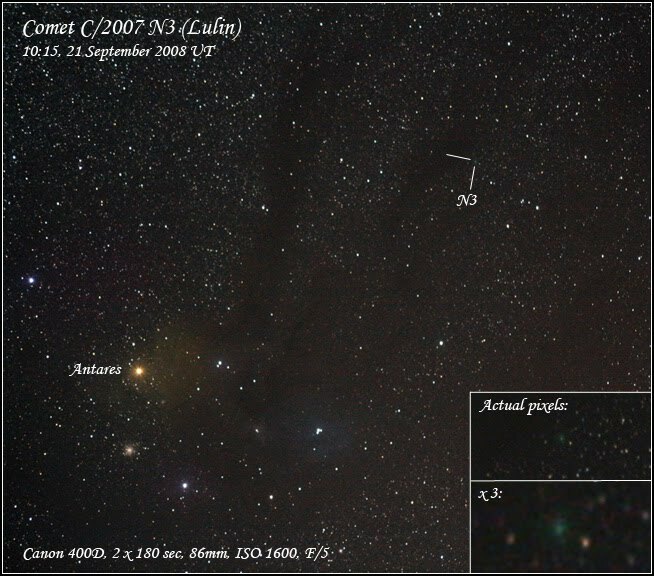 And indeed the IAU used his 2006 proposal for the name. In other news this image may be the first one of comet P17/Holmes after its conjunction with the Sun, though it shows only the very core of the coma. • An interesting animation based on Metop data shows how the Kasatochi aerosols swept around the globe - so these weird post-sunset colors imaged by yours truly from Eastern Germany on Aug. 19 could already have been caused by them (which also goes for more German sunset views from that day, this August view from Colorado or another German view of Aug. 30). • Australian views of the evening planets on Sep. 13 and Sep. 1. • Another story on the September Perseids outburst. • New insights into the 19th century eruption of Eta Carinae. • And a view of overlapping galaxies from Hubble - where NICMOS is down and only the WFPC2 working now among the main instruments. ... VMC have finally, after long delays, started to appear in ESA's public archive which is a huge FTP directory system. 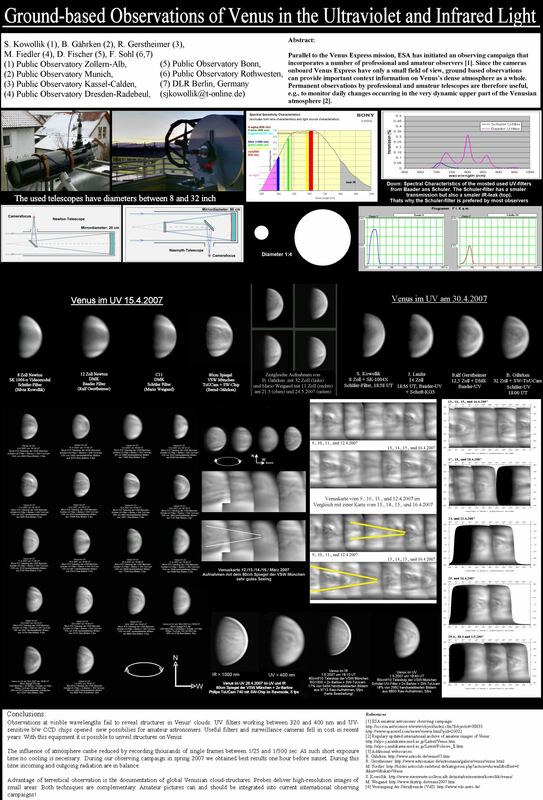 To make the images - so far only the UV channel is available, for the first 300 orbits - easier to access the Planetary Society has prepared pages full of thumbnails behind which the original data files wait, in a rather special ".IMG" format (for which free conversion software exists, however). These images could be called the 'ground truth' (although the dark features are caused by still mysterious chemical compounds in the high atmosphere) for groundbased pictures - like those obtained by amateur astronomers which fill archives in Japan or by ESA which has early seen their value and encourages uploading. Already last year a poster and handout highlighting the high state of the art of amateur planetary imaging surprised many professionals at a conference - the successor of which, by the way, will take place later this month in Münster, Germany. With, for the first time, oral contributions by amateur astronomers, filling a complete session. Fellow amateur astronomers as well as teachers can attend the conference at a drastically reduced fee, by the way, and registration isn't necessary either: just show up in Münster! 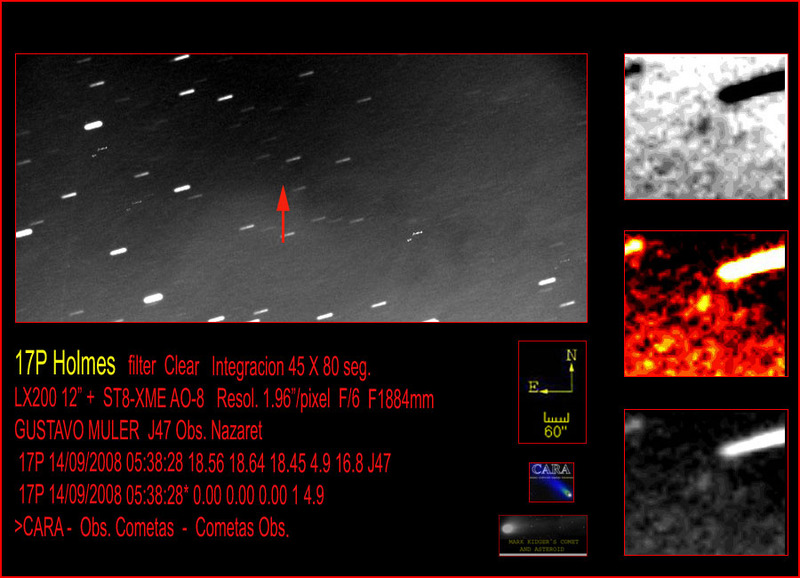 The first images and other data from Rosetta's first asteroid flyby - the first nominal science phase of the long mission - have just been presented at a news conference at the control center: A sequence of images from the wide angle channel of the OSIRIS camera unveils a diamond-shaped body of 5.9 x 4 km with 23 craters on the side seen that are larger than 200 meters. The two biggest craters are 2 km each: The impacts that caused them must have fractured the whole body. The shape of which had been predicted very well from previous ground- and space-based photometry, but the geometrical albedo of 35±5 % is lower than expected, the body thus a bit larger. A major mystery has already emerged: There is a crater chain (catena) of 7 craters, something seen only on our Moon and icy outer planet satellites so far. The mechanism that caused it (secondary cratering or an impact of a swarm of bodies) is pretty unclear. There is some regolith on Steins as indicated by shallow, degraded craters that seem to be filled up by some degree (so the cratering history is complex), and the overall color of Steins is grey. A lot more data from several instruments will be downlinked in the coming days, so a fuller understanding of yet another small solar system body will emerge soon from Europe's first visit to an asteroid. Already a few VIRTIS spectra are in - and data from the GIADA dust detector: no impacts at all, as expected for a flyby in 800 km distance. Which missed the target by less than 2 km. The phenomenon has been noted in the past week or so in several continents: An eruption by the volcano Kasatochi in Alaska on August 7 has thrown particles high enough into the atmosphere to cause unusual sunset light effects. These have been amply documented on SpaceWeather today and earlier, still earlier and even earlier, with more reports on sites in Germany and the Netherlands. • A bit higher in the atmosphere the Perseids of 2008 reached a surprisingly high max. ZHR of 110-120: Impressive composite pictures are here (larger and with 35 mm instead of 20 mm focal length), movies here, a fine individual Perseid here and many more pics here. Perseids were also observed impacting on the Moon. • There are also a video meteor summary for July, a daylight fireball in AZ and a potential megacryometeor fall in Jordan discussed here and here (in Arabic). • And again at the edge of space we have NLCs seen from the ISS and bright ISS trash seen from Earth. 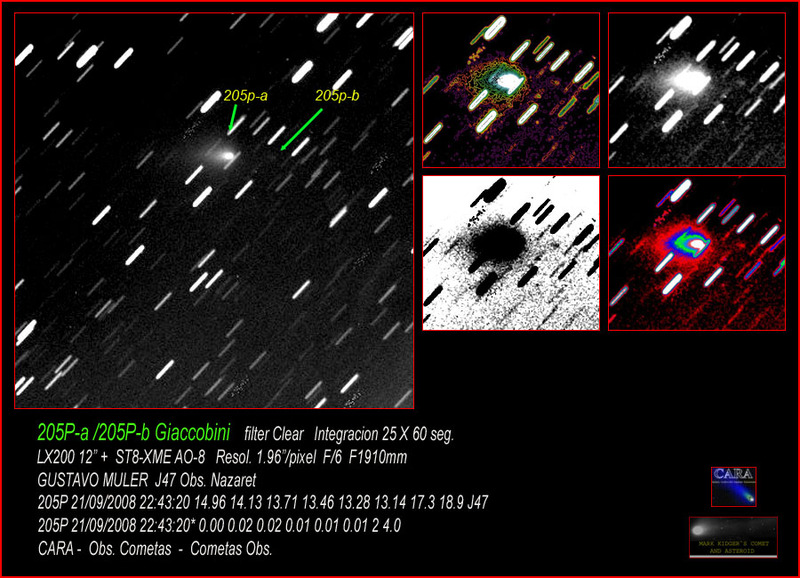 In (lots of) other news the first comet discovery by a Swiss amateur astronomer is being hailed (as is a recovery by an Austrian amateur). • We have nice images of C/2007 W1 (Boattini) of Aug. 16 and Aug. 14, marvel about the strange light curve of C/2008 A1 (McNaught) and an outburst of 6P/d'Arrest seen here on Aug. 27 and Aug. 24, still have hope in C/2007 N3 (Lulin), seen on Aug. 17, have a movie of 51P, see 67P and 47P as a pair and C/2005 L3 (McNaught) next to a supernova. • In and beyond the Kuiper Belt two strange bodies have been found, one with an extremely elongated orbit, the other one orbiting backwards. • The continuing low activity of the Sun is raising eyebrows, but August was not spot-free: A small one had briefly shown up without getting an AR number though. • In amateur astronomy we have a long portrait of an enthusiast from Oz's Gold Coast, a story on light pollution in the NYT Business(!) section and a helpful name resolver tool. • On the practical fron one can worry about leap seconds and celebrate the roll-out of Atlantis which will head to the HST (with Oct. 10 as the new target launch date) as well as the LSST main mirror blank that its creators call "perfect". • In science a surprising minimum mass for dwarf galaxies has been found, our planetary system may be unusual after all (though this is only a simulation) - and new data confirm the "hockey stick" rise in global temperature: This planet is warmer than it should be. • Finally it may be noted that a strange attempt to reverse the new nomenclature of the solar system didn't generate the desired media impact and was instead seen as a failure, simply boring and way too emotional, for whatever reason. It simply does't depend on what to call it to make a small body fascinating. And if you like it big, how about the largest solar system on Earth, with the planets to scale? After August brought us two or three eclipses, September 2008 isn't that rich in natural celestial extravaganzas - so we produce them ourselves when Rosetta flies by asteroid (2867) Steins today at 18:58 UTC. Downlink of images and other data will take a few hours, so it gets really interesting only tomorrow. Also this month the ATV will become a huge man-made meteor - which some plan to observe from the air. Sep. 6, 10:00-11:00 UTC news conference - streamed on the web - on the outcome of the Steins encounter which ESA already is blogging about quite frantically. Sep. 12: Venus 0.4° from Mars; may be a telescopic daytime target. Sep. 13: Uranus in opposition at mag. 5.7. Sep. 19: Venus, Mars and Mercury form a 4° triangle; may be visible telescopically in daytime in Europe, for more Southern regions see below. 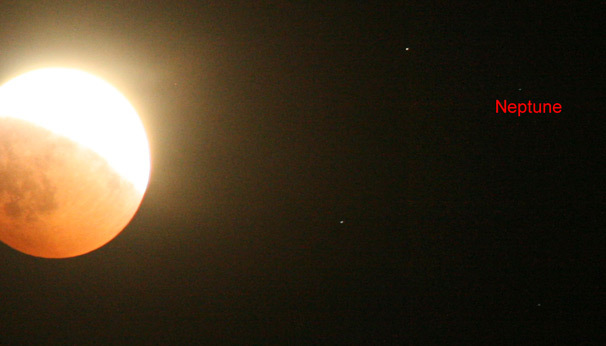 Sep. 20: Another Plejades occultation by the Moon (in the wee hours for Europe). Sep. 27: Waning crescent Moon visits Saturn - the morning visibility of the latter (with rings at a shallow angle) begins. Sep. 29: Controlled deorbiting of the ATV over the Pacific Ocean - the reentry will be observed from two airplanes for scientific reasons. Observers in the Southern hemisphere have more planetary fun now with Venus, Mercury and Mars easily seen in the evening sky on Sep. 2 (another picture). From lower Northern sites the trio may be visible very low on the W horizon these days, but binoculars will be needed. From the soil of Canada the eclipse could be seen, as a dramatic picture (from Alert) in this story as well as this picture (from Somerset Island) demonstrate. From an icebreaker in the Arctic comes this report. The polar flight out of Germany is featured in this report and this story, plus a widely read German news story. Many more reports and pictures from (low) Russia are here (another "Druckmüllerization"), here (striking contacts composite), here, here, here (very hi-res) and here. From the Russian Altai (close to Mongolia) comes this image, taken here, while other sites were cloudy, as these pictures from another expedition nearby show. From China's Xinjiang province we have a more complete picture report by yours truly (and also a new trip report in German), a study of the sky polarization (plus much more from the same trip) and a view from the edge of the zone of totality with extended Baily's beads. From China's Gansu province many more results and reports have been published here and here (with a nice flash spectrum) and here and here and here and here and here (cool foreground) and here. Finally from Xian with a very low Sun comes this report, with the eclipse here. So, as in 2006, totality has been seen from the ground along almost its complete track! The partial lunar eclipse two weeks later was also observed widely in several continents - and used for some experiments. For example by compositing the segment of the umbra that swept over the Moon its size could be measured; these composites were popular with this deep partial eclipse are rarely before as images here, here, here (also here and annotated) and here show. Others tried High Dynamic Range imaging (here, here and here) or observed stellar occultations or nearby Neptune (more) during the eclipse which was webcast from many places. Yet more nice pictures of the event are here, here, here, here, here, here, here, here, here, here, here and here. The Chinese lunar orbiter, by the way, was not harmed by the event. Want still more recent "eclipses"? The Moon in the Plejades cluster another week later can be seen here (yours truly - no tripod ...), here and here.